Yes, rabbits can eat apples, but they should be a limited part of their diet. A rabbit’s diet should be comprised mostly of hay and supplemented with a small amount of vegetables and pellets. First, let’s look at what apples are so that we can better understand the benefits and cons of feeding them to rabbits. Apples are fruits in the family Rosaceae (which includes pears, cherries, peaches, and roses). They originated in Central Asia but are grown all around the world due to their popularity. Apples are very sweet and packed full of water. Their high sugar content makes them a well-liked treat by rabbits. Apples are high in fiber which is necessary for rabbits’ digestion to work properly. Fiber is especially important in rabbits’ diets because they do not have peristalsis (constant stomach movement that enables food to pass through their digestive tract). Apples also have high water content and are a good source of potassium, both of which are good for rabbits’ health. Potassium is especially important to help prevent hypokalemia (lower than normal levels of potassium in the bloodstream). Rabbits with hypokalemia show signs of muscle weakness, stunted growth, cardiac arrhythmias, and weight loss. Apples also have antioxidants (compounds that defend cells from free radicals) which are beneficial to rabbits’ overall health. Sadly, there are some cons to feeding rabbits apples that you should be aware of. One of the most important cons is that apple stems, cores, and seeds contain cyanogenic glycosides which are poisonous plant toxins that are extremely harmful to rabbits. These toxins can cause upset stomach, diarrhea, vomiting, respiratory problems, reduced heart rate, and convulsions. In extreme cases, they can even result in death. 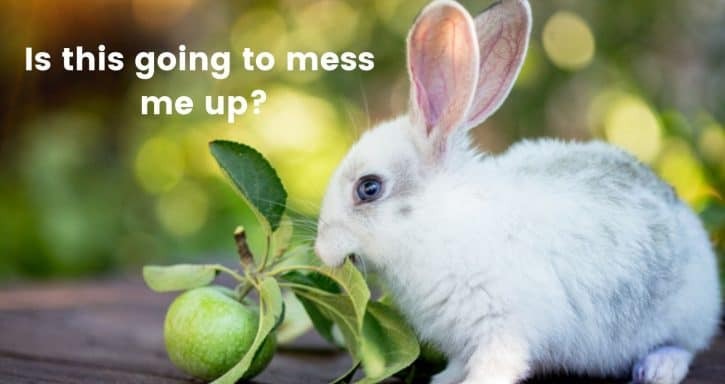 Unfortunately, rabbits don’t have a way of sensing this by smell or taste, so it is up to you to be a responsible pet owner and make sure that they don’t eat these parts of the apple. The best way to prevent rabbits from ingesting these toxins is to always cut up apples before feeding them to your rabbits. Not only does this help eliminate toxins, but it helps with the second con of feeding apples to rabbits: sugar. Apples have a high sugar content (especially by rabbit standards), and therefore they should be limited in their diet. Large quantities of apples/sugar can lead to problems like tooth decay, obesity, and diabetes. 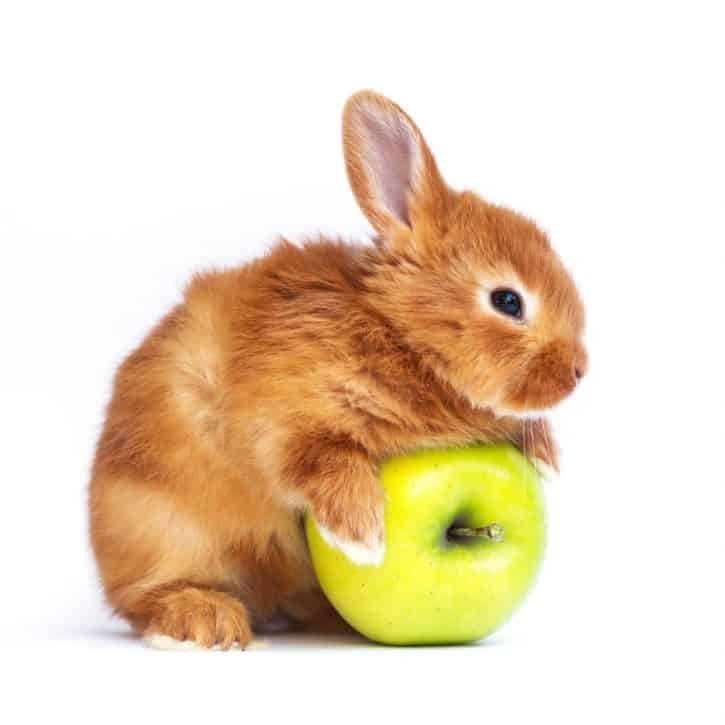 Cutting up apples (while leaving the skin which is high in fiber) enables you to portion control how much sugar your rabbit gets. One to two slices as an occasional treat should be the goal. Also, apples should always be washed to make sure they are free of chemicals and pesticides which can be harmful to rabbits. Lastly, rabbits have very sensitive stomachs, and some do not fare well with eating apples (every rabbit is different). You should always slowly introduce any new foods into your rabbits’ diet and keep an eye out for any loose stool or stomach discomfort to be safe. Summary of Can Rabbits Eat Apples? Yes, although they should be treated as treats, and a rabbit’s diet should be comprised mostly of hay and supplemented with a small amount of vegetables and pellets. Apples do have some benefits for rabbits: they are high in fiber (especially the skin), water, potassium, and antioxidants. However, there are also several cons: they have toxic parts which can be cut out, are high in sugar, may contain pesticides, and they might upset some rabbits’ stomachs. You should always wash and pre-cut apples to help with portion control and to remove the stems, cores, and seeds which are poisonous to rabbits.